April 2, 2019 , 8:18 am in Products . This post may contain affiliate links. 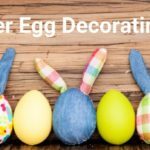 Hello, I’m Nicola, a deal hunter at FamilyBreakFinder. I’m also a mum and I’ve always travelled a lot with my two girls. It can sometimes be challenging, to say the least. From changing nappies in undesirable small spaces to boredom at the airport, it can leave you wondering whether it’s worth the hassle..of course it is! To help you save your sanity and make the most of your holiday I’ve created this list of 14 essential travel products. Putting up a foldable cot can be frustrating and the last thing you need when you want to put your little one to bed. This BABYBJÖRN Travel Cot is a breath of fresh air. 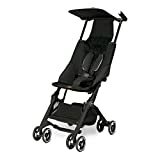 It’s lightweight and super easy to set up – plus it can also double up as a handy playpen. I could not go travelling without a stroller. The lighter the better! I’ve spent many an evening on holiday walking my little ones round in their stroller. They happily doze off in the balmy weather and leave you to enjoy a few relaxing moments, whilst they are sat close to you. Some restaurants don’t have highchairs (or they’re all taken!) so this flat pack highchair really does come in handy. It’s perfect for your self catering accommodation, knowing you have somewhere secure for your little one to sit in whilst they eat! I definitely see this as an essential. Age range: 6m to 3yrs. Not to be used on glass tables. 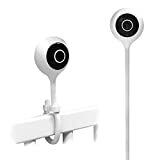 If you’re staying in a villa and you want to keep an eye on the children whilst you are in another room, this product is great. It is a smart Full HD baby monitor. The video is crisp and clear and it even has night time mode. It detects motion, sound and tells you the temperature and moisture. Perfect if you’re abroad and in a hot climate. It can also be used as an indoor security camera. View Your Baby at Any Time from Anywhere: Traditional monitors are limited by distance. Your mobile device is now your powerful display monitor.Whether at work or traveling, you can see a live view from your phone. Never worry about running out of range or being tethered to a parent unit again. Voice Control: Work with Alexa Echo Show directly, to view your live video with a simple voice command and easily integrate Panamalar baby monitor into your smart home. 1080FHD Resolution: 1080P high quality video gives you a crystal clear view of the baby in day or night, and pinch-to-zoom to see every details. 2-Way Talk & Night Vision: Comfort and talk to your baby from anywhere, whether you're at the office or in the living room. And near-invisible infrared LEDs let you see your baby clearly even in total darkness. Smart Detection & Storage: Get motion and audio Alerts, temperature & humidity notifications sent to your smartphone, control the good nursery condition for your baby anytime. Available for cloud storage and local storage with 128GB MicroSD card. You will need the right car seat and this one packs flat for convenience. It’s handy to know most airlines will allow you to bring your car seats for free and it will not count as going towards your baggage allowance. If there is an essential accessory for a new baby when travelling, it has to be a baby carrier. They really make your life so much easier! You can hold your baby without using your arms and keep them safe and snuggled whilst you enjoy your surroundings. Making your life easier with a machine washable French Terry blend and a lifetime guarantee. Bond with your little one while getting back into the swing of things: you'll be able to tie this once and then wear it out and about. The Spandex in our wrap allows it to retain it's shape and not loosen or sag as you re-adjust to nurse or take baby out to go for a ride in the car. Nursing your newborn in the wrap is comfortable and discreet. Check out our nursing videos on YouTube! These car seat bags are a great invention. It protects it and so much easier than carrying or dragging along! ONLY BUY BAG for £16.99 from THOMO PRODUCTS LTD- others are fake. TAKE THE STRESS OUT OF TRAVELLING WITH SMALL CHILDREN- take your own car seat but know it is protected. Bright colour to easily spot and folds into a compact pouch to fit into your handbag. XL stroller bag for airplane will fit most major brands of car seats and strollers. SAFE AND HAPPIER KIDS - Take your child's car seats with you whenever you travel - never have to worry about their vehicle safety. Car Seat cover bag is water and mould resistant to protect your car seat from germs. 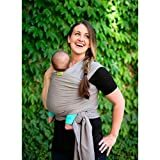 FREE UP YOUR HANDS TO LOOK AFTER YOUR BABY -  Gives you more carrying options with backpack style including 2 padded shoulder straps or using the reinforced handle. Ergonomically designed so it is comfortable to carry through the airport. 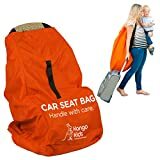 SAVE MONEY BY PROTECTING YOUR EXPENSIVE CARSEAT - Heavy duty, durable and tear proof with drawstring closure and flap over opening to ensure car seat does not open or get damaged in transit. Ideal bags for checked baggage and airplane travel. ORDER NOW - WORRY FREE WITH OUR 100% BETTER THAN MONEY BACK GUARANTEE. We offer a BETTER than money back guarantee, if there is an issue with your product for any reason we will REFUND you and SEND YOU A NEW ONE - you can't ask for better than that! A good pair of noise-cancelling headphones can completely change your inflight experience. Instead of the noise around you such as crying kids and plane engines, you can relax in your own little bubble of silence or song. You will not believe how much you can fit into these travel cubes. 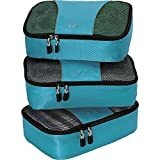 Travelling with kids you tend to take everything except the kitchen sink, so these travel cubes can really be great space savers and will fit perfectly into your luggage. Everyday nappies are not suitable for use in a pool as they absorb water. Normal swimwear on its own will give no protection against any accidental number twos, so you really need a proper swim nappy to stop any poo dramas! That wouldn’t be a good look around the pool. Perfect as travel bed for children. You can inflate and put in front of the child’s plane seat. Then they can rest their head on the pillow with their legs on the seat. Works a treat. 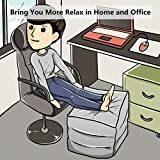 Also great for putting your feet up almost anywhere. All round essential for comfortable travel. Now my girls are a bit older but some of my friends swear by these non leak sippy cups. So useful if you don’t want soaking wet clothes whilst on the move. Now these are so handy whether you are travelling or not. I would say if your baby/ toddler is of nappy changing age then this will save you many an awkward nappy change. You know where it’s been and you can keep it clean and hygienic. It folds away into a handy carry pack plus you can store all your wipes and nappy changing essentials in it too! SAFE and EXTREMELY PRACTICAL - This portable, high-quality diaper change station comes with a detachable padded changing mat 64 cm long and 55 cm wide. It's wipeable, easy to clean, waterproof, and keeps your infant away from dirty surfaces and germs. Ideal for travel, daycare, and home. LIGHTWEIGHT but SPACIOUS and WELL ORGANIZED - This portable changing pad with storage makes diapering hassle-free. The large mesh and zippered pockets are designed to have everything handy, to hold diapers, wipes, creams, baby oil or small toys for the little one. NO MORE HEAVY BAGS - just this perfect diaper clutch designed with YOUR NEEDS in mind - Have everything you need in one secure bag. The exterior slick zippered pocket can hold essentials like your phone, keys or napkins. Use the buckle strap to clip it to your wrist or stroller. DIAPERING ON THE GO? - Nothing SIMPLER. Compact and lightweight when folded, this travel changing station unfolds to 40.95 inches to protect your newborn or toddler and offer maneuvering space. SATISFACTION GUARANTEED - Offering the very best for your baby is the most important thing in the world, right? We are confident that we can do exactly that for you. If you are unsatisfied for any reason, contact us for a replacement or a refund. Probably one of my best ever purchases! 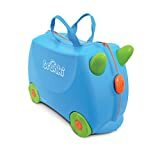 The Trunki pull-along/ ride-on suitcase is loved by most kids as it effectively doubles up as a suitcase. It’s perfect for filling with toys and essentials, but also as a seat for tired kids or they can even ride along on it when they want some fun at the airport! The Trunki also comes in an array of colours and fabulous, fun designs.